Missouri’s "regionalization of homeland security" plan is focused on establishing a common sense,logical governance structure and process to facilitate local,community level engagement in not only grant funding priorities and strategies,but other homeland security related decisions. 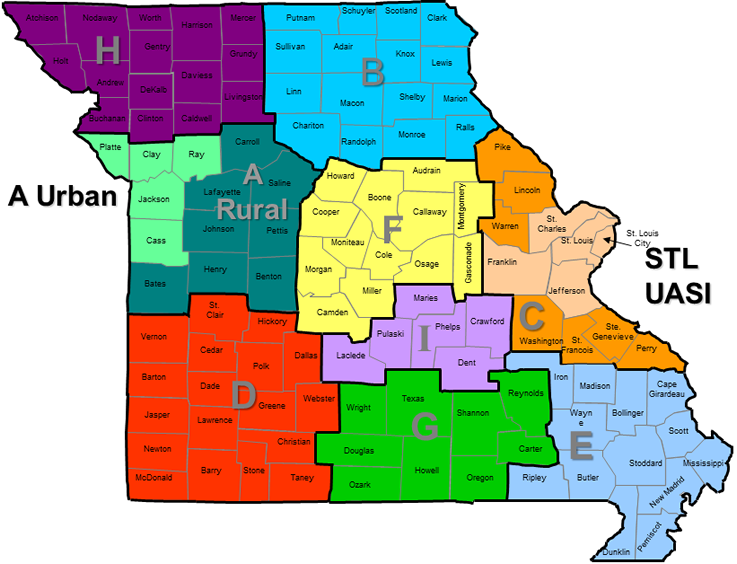 The RHSOC geographic boundaries are based on the established boundaries of the Missouri State Highway Patrol. Fourteen (14) core disciplines at the county/local level have been identified as minimum voting participants in these regional committees. While only one individual from each discipline in a specific region will hold a voting seat on the committee,it is mandated that they represent all segments of their core discipline members in their region,including both county and local interest. They accomplish this through establishment of working groups within each discipline that are all inclusive in of their specific discipline in their geographic region. The RHSOCs meet quarterly,with additional meetings called as needed to deal with specific issues. Lists of members and contact information for each region can be found here. Every Regional Homeland Security Oversight Committee (RHSOC) and Urban Area Security Initiative (UASI) Chair serves on a Subcommittee of the Homeland Security Advisory Council (HSAC). This committee meets prior to each quarterly HSAC meeting to facilitate communication and needs directly from local partners to the state governing board. Conversely, the HSAC establishes best practices, recommendations,and requirements to the regions via this committee issued in the form of standardized By-Laws. This group elects a Chair-of-Chairs to represent their interests to the HSAC. Quarterly meeting dates can be found on the OHS Calendar.